I first made this post in May, back when I first started this blog. (Seriously, it was my third post!) It’s an oldie-but-goody, so I wanted to republish and hopefully breathe some life back into it. These are some of the minerals from my personal collection, labeled with their actual name and chemical composition. Below the real-life labels, I’ve also identified their type using the naming convention from Renatus. I hope that these images can serve as a visual guide for some of the crystals described in the books! 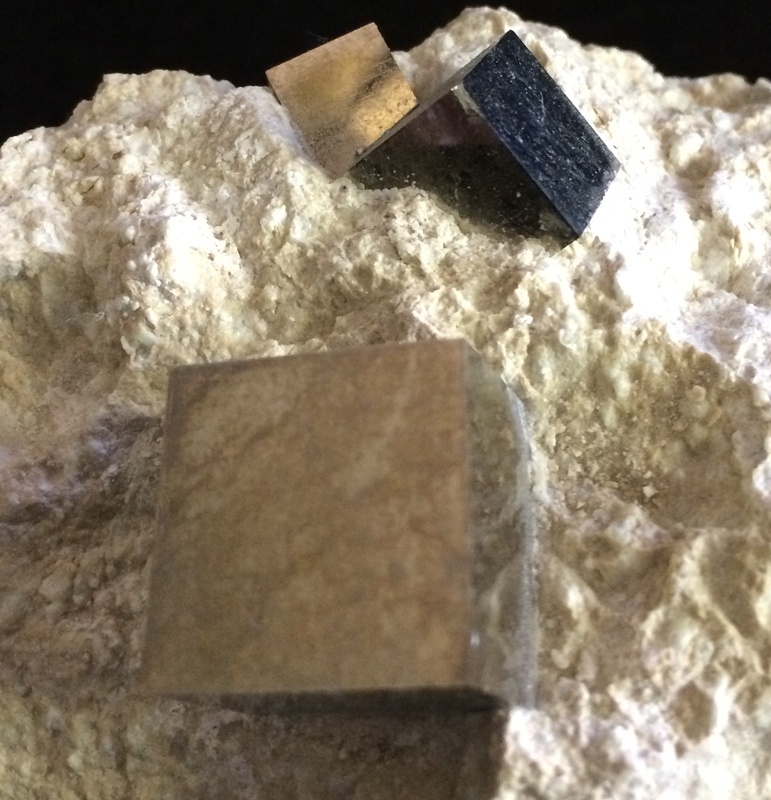 Pyrite on Quartz, Air/Metal-Fire/Metal This is an example of a crystal that would be considered to have 3 elements. 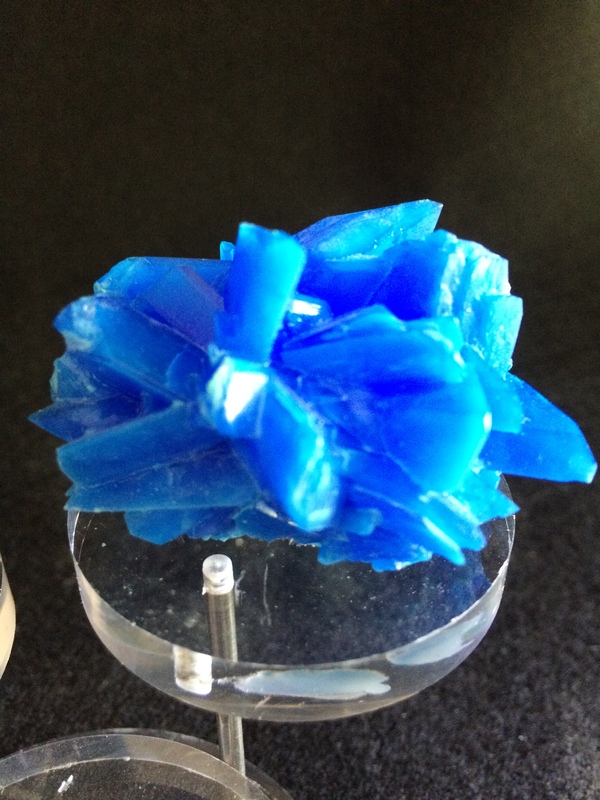 Chalcanthite (CuSO4·5H2O), Water-FireNote:Mineral is naturally occurring but my specimen is man-made. 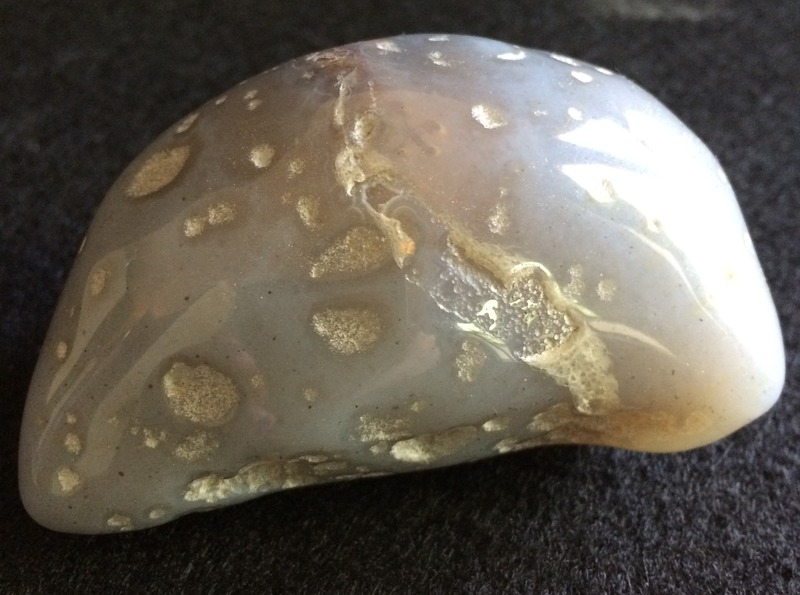 Enhydro Agate (SiO2), Air-Water This piece of agate is hollow with water and an air bubble trapped inside. If you hold a flashlight to the stone you can see the water slosh around, but it doesn’t photograph well. Next postNetGalley Members and Book Bloggers: Looking for a good (free) book to read? I love mineral collections, and this seems well thought out for your story. Always nice to see other people interested in collecting minerals. One of my longer-term goals is to build a cabinet to display some of mine. Also trying to figure out what to do with an embarrassing number of thumbnails in perky boxes. 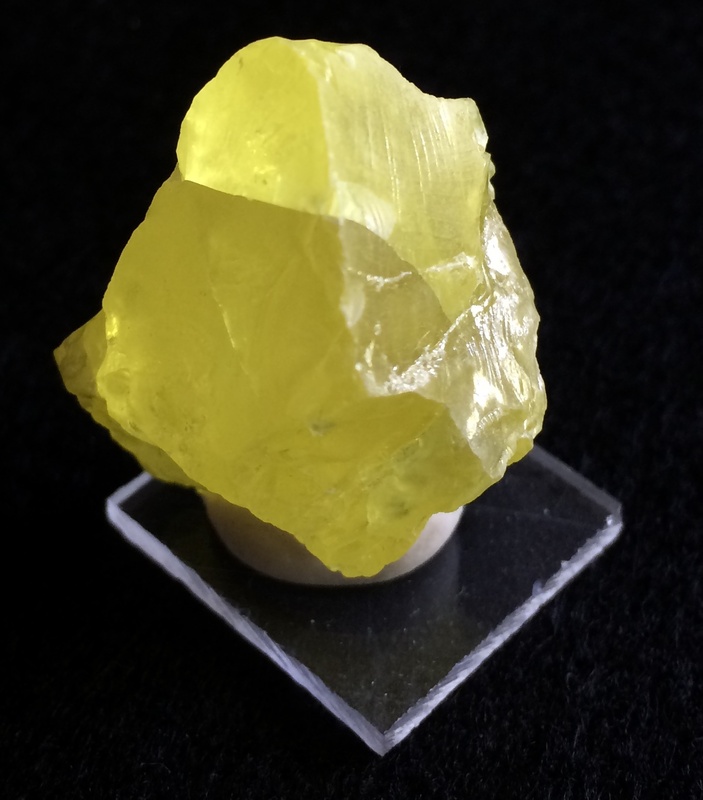 Some collectors focus on specific minerals groups – by location, by chemistry, by properties, et cetera – do you, and if so, what? Oh, those thumbnail specimens are so tempting! I’ve only bought one so far (chrome diopside), but they store so well. Looking through drawers of those tiny pieces makes me feel like a kid in a candy store. As for my collection, it is pretty eclectic because I don’t have a particular focus in mind when I add pieces. 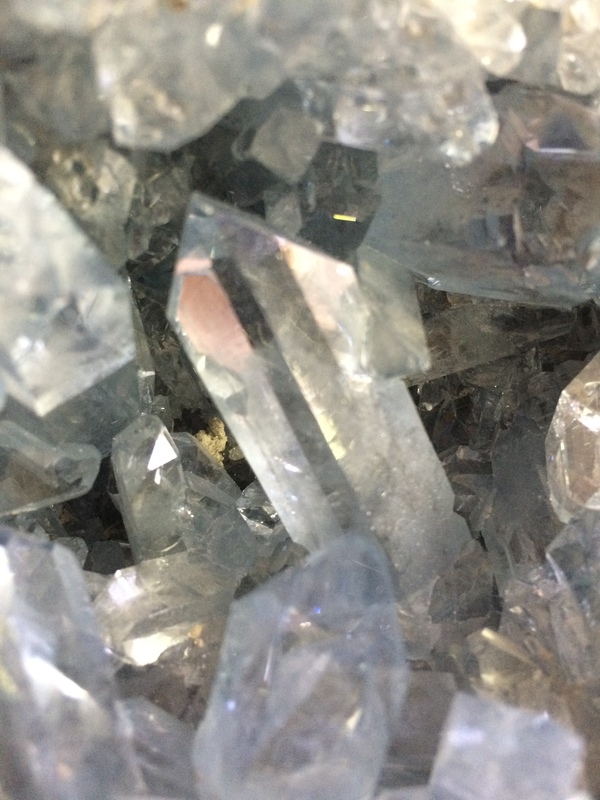 I do have an affinity for rough forms of gemstones and minerals containing less-common elements. For instance, until this past weekend, I had a specimen of stibnite (containing antimony). It took a tumble and ended up in multiple pieces, so I guess I’ll be in the hunt for a new one when I go to the annual mineral show next year. There’s a rather large expo in Cincinnati every May that I go to for an annual stock up. It’s nothing like the big one in Phoenix, but still has a fantastic variety of vendors and displays of others’ collections. 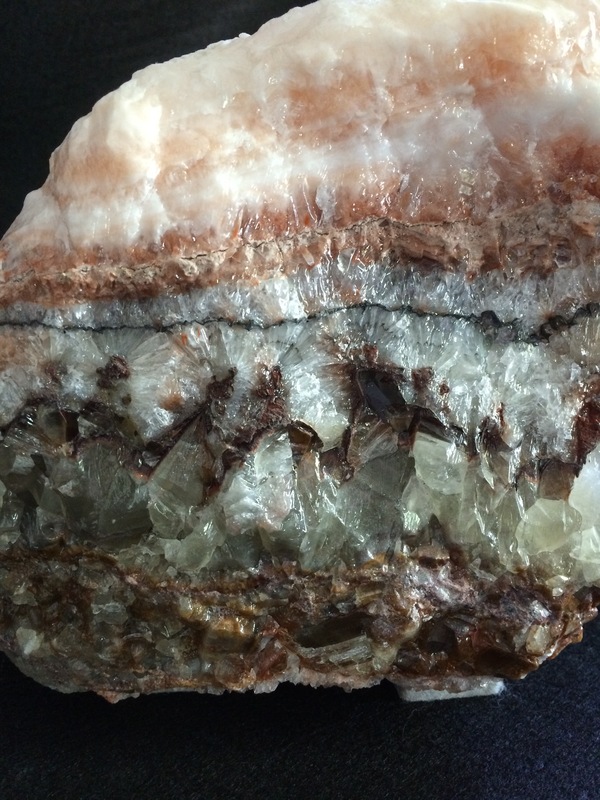 Do you have a common theme for the minerals you choose for your collection? I agree, a flat or two of thumbnails and a 10x loupe or a low-power microscope can be a great way to spend a hour or two. Stibnite is very fragile, especially some of those lovely Japanese pieces. Sorry to hear that yours went to pieces. Ever considered using it for old-fashioned quantitative testing? Dissolve it in acid and do a flame test for antimony, streak test it, or heat it in a candle flame to see what happens? Good times. 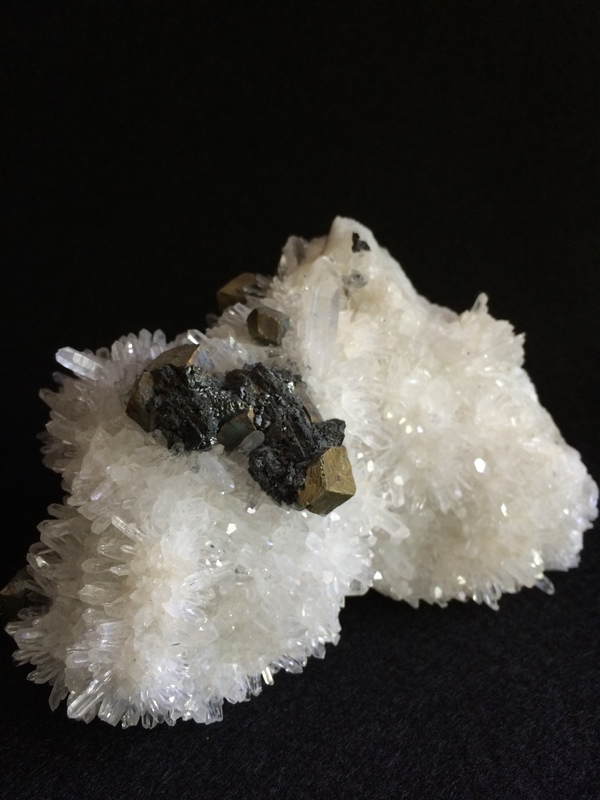 I have three main areas in my collection: phosphate / arsenate / vanadate minerals (pyromorphite, mimetite, vanadinite, et cetera); English minerals (ever seen those beautiful, gemmy green fluorites from the Rogerly Mine in Derbyshire? ); and fluorescent minerals. If you don’t have a good SW/LW fluorescent lamp, that’s a great investment for a collector. 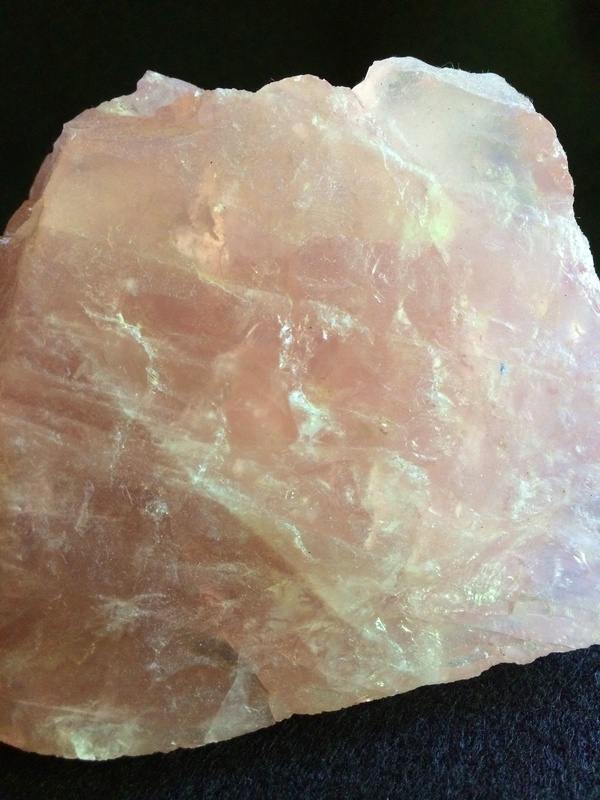 My favourite find ever was a fist-sized chunk of hyalite opal that I picked up off the ground when I dragged my family to the Topaz Mountain collecting site in Utah (near the town of Delta, and worth a trip): rather plain in daylight, fluoresces a brilliant green. All the rest of my “finds” on that trip came from the rock shop in Delta. All of that sounds rather grand, I’m afraid, so I hasten to add that my collection isn’t that big, and mostly small-cabinet sized or smaller, and it’s almost entirely boxed and stored at the moment. My father and grandfather collected, though, which means I have a slight head-start on most people. Interesting chemistry appeals to me too: I’d love to lay my hands on a specimen of halfnon, for example. 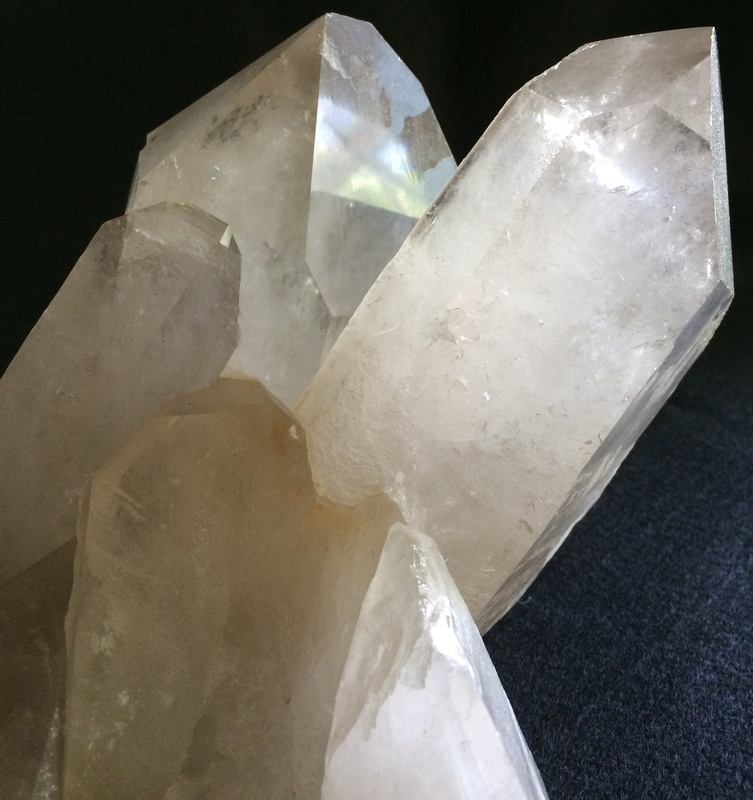 I’m sure that you know the website mindat.org, which lets you search for minerals by chemistry, and is therefore another helpful way to compile a shopping list. I’d love to have a single specimen from that quarry in Ytterby as well – four rare earth elements in one go. Of course, since traces of the REEs are supposed to contribute to fluorescence, I suppose that I have some already, just in minute quantities. I’ve read about the Cincinnati show, but never been (nor to Tucson either, though my father used to go with his uncle, who was an Arizona turquoise dealer, thirty years ago). I’ve been to several different central Midwest shows over the years, from terribly small (Topeka, Kansas springs to mind) to Omaha and Kansas City. I’m still planning to get to the big Denver show in September on of these years – it’s only about a nine hour drive from me, leaving lots of room to bring back treasures. Or just my luggage and the small bag of things that I was actually able to afford. Yes! minedat.org is one of my bookmarks, along with John Betts Fine Minerals (http://www.johnbetts-fineminerals.com). I haven’t actually purchased anything from them, but browsing the catalog always whets my appetite for new specimens. I don’t have any of the phosphate/arsenate/vanadate minerals in my collection yet, but vandanite is on my to-buy list. I just haven’t found the “right” one yet. Love that brilliant red color! 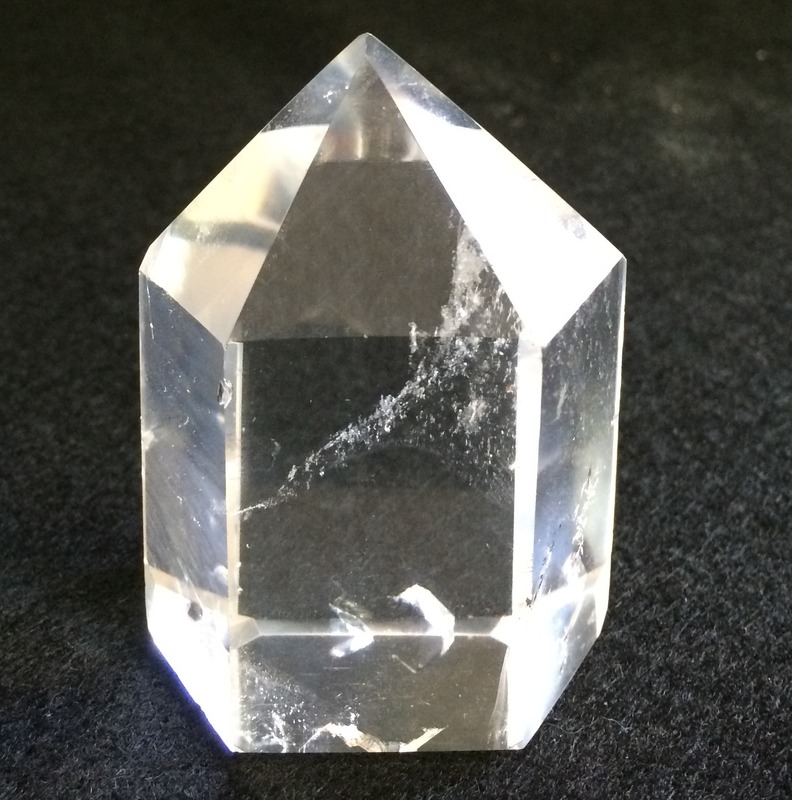 I’m also in the hunt for the “right” piece of halite (with distinct cubic crystals or the concentric square stacks) and liddicoatite tourmaline (one with concentric triangles). 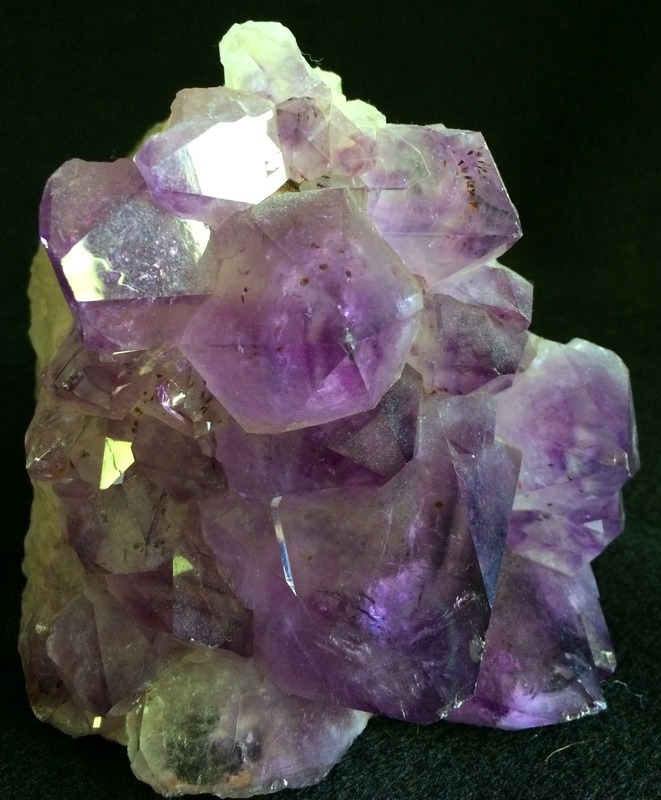 Do you have a fluorite specimen from Rogerly Mine? The ones I have seen are such an amazing deep green. I’m jealous, I would love to visit a mining site. This area of Ohio, and other areas within driving distance, is better known for fossils than minerals, sadly. While it is cool to come across an ancient piece of coral in the garden, its just not the same as pulling garnets out of the ground (which I did get to do once in NC). Yes, the fluorescence of minerals really adds an interesting, and often unexpected, dimension to their appearance. The Cincinnati show has a booth set up each year with a display of minerals where you can see them in natural and UV light. I’ll be making a post later this week (probably tomorrow) to share photos of the rest of my collection. The minerals in this post were ones that haven’t been altered, or have only minimal cutting/polishing etc done. The rest of my pieces have all been altered in some way so they aren’t as representative of their natural forms. Very cool post! I always picked up shiny rocks and minerals as a kid too. I especially loved this one piece of fire opal my grandfather had. Your naming scheme for your books is clever as well! Thank you! And, yes, fire opals are beautiful stones! Opals are my birthstone, but I only have one in my collection so far. Ahhh I love beautiful rocks! Chalcanthite drooooollll, so beautiful! I’m always getting little bags of rocks in the kids section of geology stores. Ugh, that’s too bad! It seems like, no matter how careful you are, something always gets lost when moving. Like socks into the dryer. We’re still looking for a box of books from a move 2 years ago.